This makes the amount of times sys_spu_thread_group_join returned always be equal to the amount of times sys_spu_thread_group_start was called, and the amount of times a termination signal was signaled. This also means that when executing a second sys_spu_thread_group_join, it waits until another signal will be received. In theory, to exit from this situation another thread has to call sys_spu_thread_group_start, and waiting until the SPUs signal termination again. 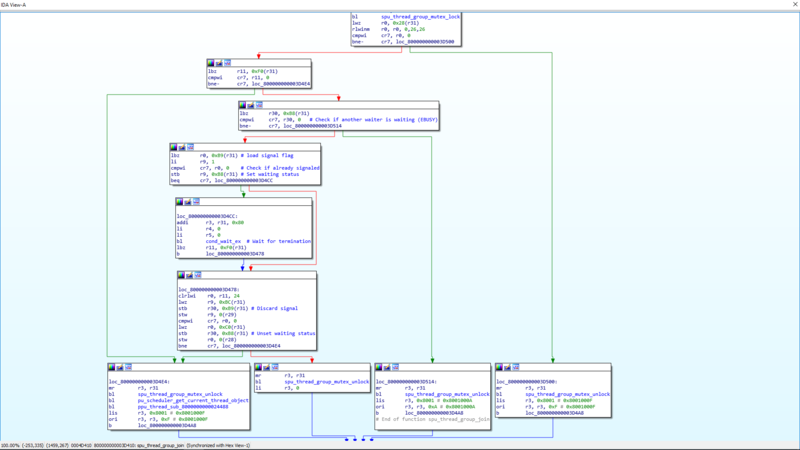 Past tests hinted this behavior, although it was unclear if an absolute deadlock occurs on the second sys_spu_thread_group_join execution, or how to exit from this situation. Ugh why you change stack arg positioning? #5325 only changed min stack frame in the case of zero stack args.